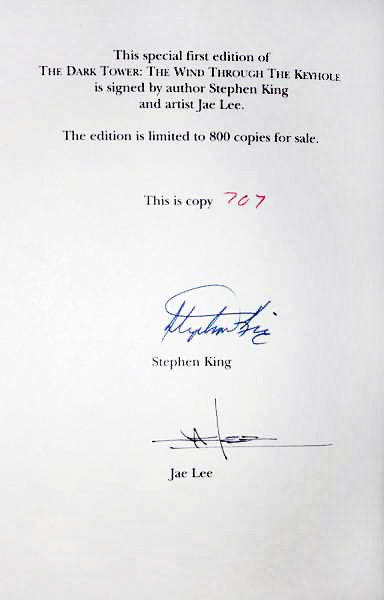 There was quite an uproar in the King community when it was annouced that only 800 copies of this book would be released. Using their long standing system Grant annouced that only people that had numbers 1-800 of Little Sisters of Eluria would be eligable for a copy of TWTTKH. This also caused an overnight split in the value of LSOE, with copies under 801 basically doubling in price and higher numbered copies dropping in value. Grant explained that King was only willing to sign 800 copies of the book, it was not their choice to release this number of copies. Some collectors accepted this explanation, others were still angry at Grant and/or King feeling slighted by loosing out on this book even though some had been buying every DT limited as far back as WasteLands.